I'd heard from a few that this place was good. Finally walked in today. Walking from the bright sunlight into a black room I felt like I had walked into the Spook House at a theme park. Took the eyes a while to adjust. I usually prefer to sit at a sushi bar, especially when I'm alone, but only if the seats are regular chairs, not high chairs. So I sat at a table alone. I don't like the dangling-feet thing. Staff was warm and friendly. I ordered just green tea and looked at the menu. It was the middle of the day, I was not about to order sake, so I thought tea was a normal option in a sushi place. Usually you get a pot and a little cup at no charge. What I got was a big white mug with a handle and a tea bag. Okay. I ordered yellowtail sushi and wasabi tobiko with quail eggs, and a rainbow roll (which is not your normal rainbow roll; this one was crawfish salad and avocado topped with different kinds of fish, and something that gave it crunch, can't remember if it was tobiko or tempura flakes). I asked if "sweet prawns" came with tempura fried heads, and was told yes. I was surprised since it's usually baby shrimp that is served that way, but sure, I'll try it, sounds good. Waitress came back, sorry, all out of prawns. Okay. I didn't see uni on the menu, do you have uni? Sorry, no. No uni?? is this a serious sushi bar, without uni? Hmmmm. So I'm waiting for my food and I'm looking around. The place is seriously high tech and tries hard to be very uber cool. Everything is ultra modern and black, except for flashing multicolor lights under the lip of the sushi bar. My ears are assaulted by too-loud techno-rap-rave music. Over the sushi bar is the center of attention, a HUGE flat screen TV which has the show "COPS" on. Okay so for me, sushi is an experience. Calming, a joy to the senses. But here...not sure what they were going for. Maybe looking for the hipster crowd. Oh yeah there's such a hipster crowd in New Port Richey, everyone dolled up in 6" stilletto heels out for a night of disco dancing and munching on faux sushi. The food came, I have to admit it was good. Nice and clean and fresh. The roll was great. But between my eyeballs being assaulted by COPS dragging around drunks in their underwear, and blaring commercials on the radio....I won't go back. I'm wondering if maybe the choice of music and the choice of TV station were decisions made by the young staff, and the owner was not on premises? Okay, spend a few bucks and buy a few CD's, for crying out loud. A radio station blaring commercials as I'm trying to dine? And MUST I be watching COPS? Why that tremendous TV? This isn't a sports bar. A giant fish tank would be much more appropriate. Have you tried Hiro's?????? They use Fresh Fish! I love Hiros! I will try this one though~thanks to your interesting review! I did, when they had just opened. There was only one table taken besides ours, and maybe 6 people at the sushi bar. We ordered only one roll and some sashimi. We waited over 45 minutes, finally walked out without any food. I've never been back. It was when they were brand new, I'm sure they needed to work out kinks. I will try Hiro's again on your recommendation :) if you travel down 19 to the intersection of Nebraska, try Mike's. Serious sushi. 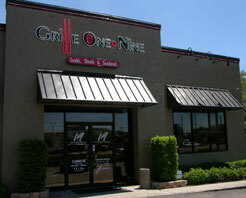 I have been back to Grill One Nine several times. I'm not a fan of their sweet shrimp with tempura fried heads (should be tiny young shrimp, not giant prawns with faces! ), and they still don't serve uni. Their wasabi tobiko is mild to say the least. If i'm just wanting edamame and fresh salmon sashimi, they're right down the street and the price is right...but I will say their Pho is spectacular.